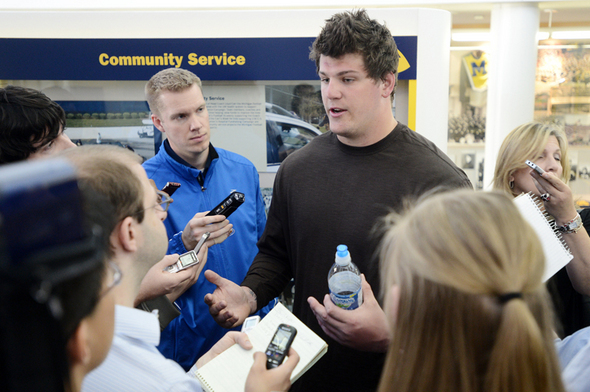 Posted on Wed, Mar 28, 2012 : 5:59 a.m.
Michigan junior offensive lineman Taylor Lewan speaks to reporters during a press conference at Schembechler Hall on Tuesday. If you see a 6-foot-8, 308-pound man riding a tandem bike around Ann Arbor, don't be alarmed. It's just your friendly neighborhood offensive tackle. Taylor Lewan bought the two-seated bicycle a couple weeks ago from Midwest Bike & Tandem. The junior likes to ride it with receiver Drew Dileo, who, at 172 pounds, is roughly half Lewan's size. "I carpool," Lewan says with a smile. Senior defensive end Craig Roh, who has known Lewan since they attended Chaparral High School in Scottsdale, Ariz., together, also has taken a spin on the new wheels. "It was a magical experience," Roh said, tongue firmly in cheek. "It's his bike, so he takes the front. Taylor’s back is the most amazing thing to look at." So, this is the Michigan football team's newly toned-down star left tackle? The one who stands before the assembled media for the first time all spring and professes how, in his third year as a starter, he has become more serious than ever? Lewan has been a goof since he first arrived at Michigan in 2009 as a budding offensive tackle prospect. He's even tattooed a mustache on the inside of his right index finger, which he occasionally holds above his lip to simulate the real deal. He calls it "the best icebreaker in the world." Yet, for all the attention he's garnered off the field, he's attracted just as much for his prodigious talent on it. He earned his first start four games into his redshirt freshman season, and has been out of the lineup only one time since. He's made each start at the all-important left tackle position, which protects quarterback Denard Robinson's blind side. Lewan's play will be of particular importance next year, considering the Wolverines' woeful depth at offensive line. They lose two starters from last year, including captain and Rimington Award-winning center David Molk. The leading candidates to start at left guard (Chris Bryant and Elliott Mealer), center (Ricky Barnum) and right tackle (Michael Schofield) have yet to start a game at those respective positions. That leaves Lewan and right guard Patrick Omameh as the only constants up front. Although Omameh is a senior with 29 career starts, Lewan seems to be the natural leader of the group because of his outgoing personality and burgeoning talent. He seems ready to embrace that role for the first time in his career. "When I came in here, I was 17 years old," Lewan said. "Now, I’m 20. I've definitely grown up as a player and a person and everything. The whole mustache thing is out the window. I’m here to play football, not here to joke around. "I’m no longer trying to be the funny guy. I know what this team is about, I know what this team wants and I know what these coaches want, and I know there’s an expectation for me. I want to exceed every expectation there is for me." Some say Lewan is destined to become a first-round pick. Seemingly the only thing keeping him from fully blossoming into that kind of player is himself. Too often, the unpredictability that made him so lovable off the field made him a liability on it. He was reckless as a redshirt freshman, when he started eight regular-season games but also was flagged seven times (penalty data wasn't available for the Gator Bowl). Lewan became more disciplined last year, when he cut his penalties to four despite starting all 13 games. Still, three of them were personal fouls. He knows even more will be expected of him next year, considering the fluidity around him and questionable depth behind him. "I'm not just going to stop being funny for the rest of my life," Lewan said. "I haven’t just given up on that. But I think there is a time and place for everything." Roh said he's seen a difference in Lewan's maturity, noting "I think he's getting more serious in all areas of his life." One example was when the upperclassmen were asked to declare their majors, Lewan was, uncharacteristically, the first player to make his decision. "Taylor has grown by leaps and bounds," Roh said. "The Taylor in high school would have been the last one, and would have had to get up at 6 a.m. to run because he hadn’t done it yet." No more running. Just biking. Wed, Mar 28, 2012 : 10:05 p.m.
Any guy who rolls with a mustache tattoo on his finger is okay with me. Go Blue! Wed, Mar 28, 2012 : 6:24 p.m.
Taylor may say that his &quot;goof&quot; days are behind him (at least or now), but I had the pleasure of seeing his performance at Mock Rock in February and he relished his role as the leader of the football team's skit. He was very funny and didn't want to give up the spotlight. I enjoy his sense of humor. Go Blue! Wed, Mar 28, 2012 : 5:24 p.m. Some of the comments Taylor makes are absolutely hilarious. Not to mention riding a twin tandem bike around campus.Now that takes some eggs! Wed, Mar 28, 2012 : 1:41 p.m. This kid is a beast. He is a very important peace to the O-line. My take is be serious when you have to be but don't lose your personality. From what I've seen on different video clips this guy would be a blast to hang out with. Wed, Mar 28, 2012 : 1:32 p.m.
&quot;He was reckless as a redshirt freshman, when he started eight regular-season games but also was flagged seven times (penalty data wasn't available for the Gator Bowl).&quot; Gator Bowl??? ?